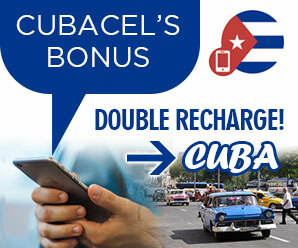 cubacayococo.com | Want to know before you go? Official Cuba Cayo Coco information and guide, get facts and latest news. The island of Cayo Coco has an area of 370 km2, the second largest in the Jardines del Rey Archipelago after its neighbor Cayo Romano with its 777 km2. They are part of a group of several islands on Cuba’s north central coast called Jardines del Rey or King’s Gardens in English. About 20km from Cuba’s north coast, in the Atlantic Ocean, the whole archipelago where Cayo Coco is located includes over 2,500 islands and islets spanning the two provinces of Ciego de Avila and Camaguey. The islands of the Jardines del Rey first saw tourist development in the 1990s, Cayo Guillermo in 1992, with the opening of the Hotel Gran Caribe Club Villa Cojimar, followed by the first resort called Guitart Cayo Coco (now the Hotel Colonial) opened in 1993 on the neighboring island Cayo Coco. At the time, there was no international airport on any of the islands. 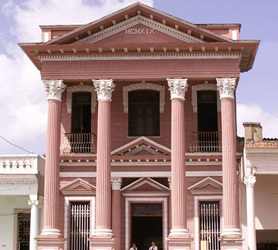 Tourists would fly into the Maximo Gomez airport located in the capital of Ciego de Avila. The construction of the pedraplen causeway from the mainland began in 1988, its 27kms (16 miles) length connecting Cayo Coco to the mainland of Cuba was concluded in just 3 years and, with it began the meteoric era of tourism on both islands in the King’s Gardens. A seven kilometers causeway, which ends with a 1.5 km bridge, was built to connect Cayo Coco with Cayo Guillermo. Cayo Coco is 506km (314 miles) from Havana. Varadero is 466 km (289 miles) from Cayo Coco, whereas the closest cities to Cayo Coco are Ciego De Avila (population of 86,100) at 101km (62 miles) and Moron (population of 60,600) 62 km (38 miles). 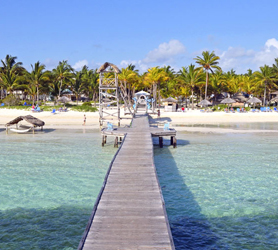 Cayo Coco and Cayo Guillermo are just 30km apart and are connected by the aforementioned causeway. 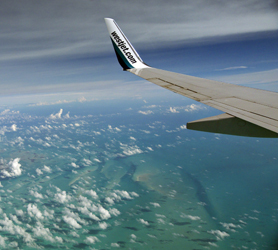 Even though there are no direct flights, to give an idea of just how close Jardines del Rey in Cuba is to The Bahamas, the Clarence A. Bain Airport (MAY) in the Bahamas is just 214 km (132 miles) from Jardines del Rey International Airport – Cayo Coco, Cuba (CCC). With regard to the United States of America, Key West Florida is just 261 miles (420 kilometers) by flight from Cayo Coco, Jardines del Rey. Posted in Where is Cayo Coco? | Tags About Cayo Coco Cuba, All About Cayo Coco, Cayo Coco Facts, Distance Cayo Coco Bahamas, Distance Cayo Coco Cayo Guillermo, Distance Cayo Coco Ciego de Avila, Distance Cayo Coco Havana, Distance Cayo Coco Key West, Distance Cayo Coco Moron, Distance Cayo Coco Varadero, Where is Cayo Coco?, Where is Jardines del Rey Cuba? Set to open in November 2014 is the brand new Hotel Melia Jardines del Rey in Cayo Coco. The 5 star hotel is said to have 624 rooms and is located on the west coast of the famous Jardines del Rey Island. Above is the only rendering released thus far and it appears to show a suit with a private pool. The naming of the hotel follows Melia’s evident force in Cuba, in which the Cuban tourism ministry allows this immensely powerful hotel chain to utilize geographic names for its Hotels. This began with the Melia Varadero in the 1990s and has extended right through the companies impressive 27 hotels in Cuba. The new Melia Jardines del Rey hotel will feature a spa, tennis courts, fitness gym, Spa & Wellness center and, both salt and freshwater pools. The property is to have a large shopping complex annex, similar to the Pueblo Las Dunas in Cayo Santa Maria. The marketing teams at Melia Cuba have seen incremental growth in reservations when visitors to their shopping centers get a sneak peek at their associated hotel, a wise strategy for clawing reservations from other hotel chains in the same vicinity. The new Melia Jardines del Rey Hotel will follow this trend with over 30 shops and 4 (payable) restaurants in the shopping mall. Guests at Melia Jardines del Rey will also benefit from up to 2 free daytime resort passes to allow guests to visit the chains Cayo Guillermo based hotels and sample restaurants, beaches and services on this neighboring island. This resort pass system was started by Melia Cuba in 2003 and has since been copied by most major chains operating in Cuba’s glorious “Cayo” destinations. As soon as the hotel Melia Jardines del Rey is available for booking it will appear amongst the hotels at the below reservation link. Be the first to stay at the hotel for the 2014 winter season! 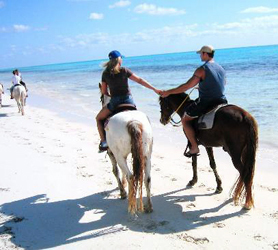 The Horseback riding tour in Cayo Coco is ideal for both novices and seasoned riders. There’s no galloping to speak of and the whole trip is taken at a trotting pace. At the beginning of the trip you sort of wonder what’s going on, you’re on this nondescript gravel dirt track behind the resorts, with little to see but mangroves either side. Then after about 20 minutes a beautiful private beach appears in the distance, this being your final destination. Once at the beach you stop at a thatched open-roofed restaurant when you are serenaded by two local singers-guitarists while eating a freshly cooked meal of either lobster tails or grilled chicken. The food is really good and the drinks are free. The Cuban lobster tail we got would have been a 90$ meal back home and, we were told that the lobsters are caught by hand, right there on the spot, a few hours before you arrive. The excursion team is very friendly and make for great hosts as your time here flies by in this idyllic wonderful setting. 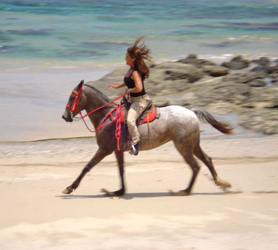 Probably the best part of this Cayo Coco Horseback riding tour is the leisurely trot back with the amazing sunset as a backdrop, riding home this time on a different route back, along the virgin beaches in front on the resorts. It will be an experience that will stay with you for the rest of your life and some photos you will truly treasure in the future. Please don’t miss this if possible. As the title says, this is a morning Catamaran excursion which ends at around midday, so you’ll be out at sea for about 2.5 – 3 hours. It does not include lunch but, onboard drinks are free. 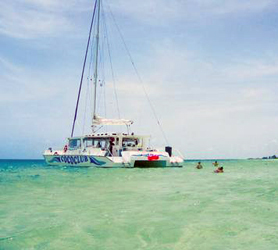 This half day Cayo Coco Catamaran version is better for those who simply wish to snorkel for an hour or two then return to shore. This Cayo Coco Catamaran cruise includes a succulent lobster dinner, plenty of snorkeling and about 2 hours to either spend at the virgin beaches or more time snorkeling. As with the half day tour, the drinks are included. It’s highly advisable to bring plenty of sunscreen as there is no below deck areas on these Catamaran vessels and 6 hours on the open sea means lots of sun. With more of a focus on drinking and partying, it’s a truly unique experience see the stars in the night sky and the lights along the coastline. The Moonlight cruise includes dinner, music & dancing and lashings of alcohol all included in the price! These vessels are extremely stable so dancing on deck is pretty easy and lots of fun. Of course, there’s the impromptu ducking of friends and jumping overboard. 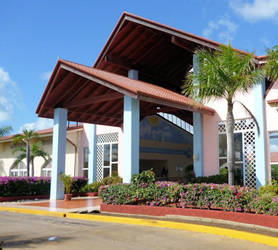 Many of the hotels in Cayo Coco offer day passes to visit hotels in Cayo Guillermo. These passes can range from being entirely free, where you simply use the all-inclusive services at the chains other hotels in Cayo Guillermo, to having a cost between 25-40 CUC. One recent example is Sol Melia offering its guests free use of their hotels in either resort. The best way to find out is to email the hotel before booking and, if you say that you have not yet booked, it could be that they offer you an email reply in which they approve this free option. One of the main reasons visitors to Cayo Coco wish to visit Cayo Guillermo is the Playa Pilar 5km beach, named after Ernest Hemingway‘s yacht, the cabin cruiser Pilar. The island provides the setting for the climax of Hemingway’s last novel, Islands in the Stream. In reality, not much different to the beaches in Cayo Coco, this beach does have a longer extension with a vaster visual appearance due to its length. Getting to Cayo Guillermo from Cayo Coco will set you back around 25 CUC in a private taxi which of course, would then be divided between the occupants. Or alternatively there is a 5 CUC per person shuttle bus service which is every half an hour. El Baga National Park is located on Cayo Coco and is one of Cuba’s 7 national parks. Named after the El Baga tree, known for its medicinal properties, the park measures 769-hectare (7.69 km2 square kilometers). El Baga offers some interesting wildlife, including; turtles, 130 species of birds, iguanas, flamingos, alligators and crocodiles. Visitors are allowed to interact with some animals and it is very child friendly and educational for both young and old. Pony rides are also offered to take kids around the mangroves, lakes and beautiful scenery the El Baga National Park has to offer. El Baga National Park is a fun packed day out where visitors can spend all day or just a few hours at the park and there’s so much to see and do the kids will love it as much as you do! Acuavida Spa Talaso is a world-class spa offering pools, skin treatments, fitness treatments, massage, Turkish baths and saunas. The Spa is located along the ocean front within walking distance of all hotels on Cayo Coco Island. The Acuavida spa comprehensive programs are focused on wellness, relaxation, stress release and beauty enhancements, using a combination of high quality products together with natural elements derived from the local marine ecosystem of the Caribbean Sea near Cayo Coco. Pamper your body with massages, scrubs and wrappings in a charming natural environment. Alternative treatments include hydrotherapy, reflexology, infusion and anti-stress sessions. Wellness programs are mixed with the natural healing programs and Thalasso therapy using seawater and freshwater in multiple swimming pools. Not a fan of diving but want to see the colorful fire corals and many types of tropical fish on the world’s second largest barrier reef of Cayo Coco? 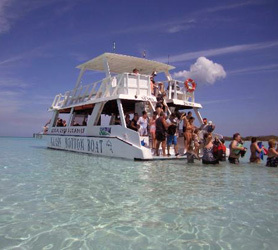 The solution is the Glass Bottom Boat Tour of Cayo Coco! You´ll be picked up from your hotel on an open topped double-decker bus and whisked to dock. At just 25 CUC for adults and 10 CUC for kids (this includes free drinks on-board), the glass bottom boat excursion from Cayo Coco is a great deal and value. The boat takes just 15 minutes to get out to the reef, at which time a staffer jumps into the water and swims along each side of the boat with pieces of bread to attract the fish and WOW!! you’ll instantly have your own aquarium right in front of your eyes. The variety of fish, colors and species are truly astounding, one would never think that so many types live so close to the hotel zone in Cayo Coco but, they certainly do! For those who’d like to get “up close and personal” with the marine life, a boat staffer offers free masks, snorkels and fins so you can jump in and swim around with the shoals. One particularly epic part of our visit was when one of the boats crew swam down, while we watched from inside, and brought back a truly enormous starfish. He then proceeded to allow kids to hold it, take photos and then proceeded to put it back from where it came. A really memorable and a great experience for the kids. You’ll spend about 45 minutes out at the reef until the boat returns. There are two daily trips, one at 11am and another at 4 pm. 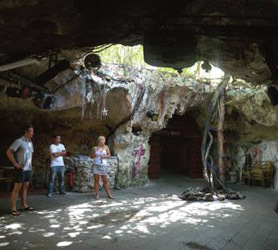 Probably the only Cave based Disco and Cabaret on the planet, La Cueva Del Jabali Cayo Coco is definitely a “must see” attraction which is just a short 15 minute bus ride from both the Cayo Coco and Cayo Guillermo tourism resorts. 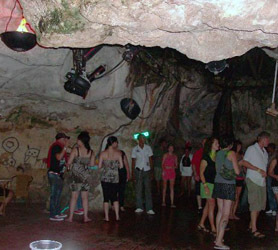 At just 25 CUC per person, the excursion includes the bus ride to the cave and a free bar for the whole evening. While the La Cueva Del Jabali closes at 2.30am daily some buses will remain until later and there’s always a ride home. Experience a real Cuban band, Cabaret Dancing then later on, the whole place turns into an excellent disco. You’re not obliged to stay until late as various buses rotate throughout the evening, meaning you can stay for as long as you like. Plenty of drink options are available at the all inclusive bar but, take a few Cuban pesos for tipping and to get quicker service. The friendly bar staff really make you feel welcome and the whole experience is quite awesome. Remember that this place is cave some some areas have quite low ceilings while the center of La Cueva Del Jabali has a massive porthole type roof to see the stars. Remember to dress lightly as it gets hot and humid in the cave as the night progresses. Of course, if you’re with kids, the La Cueva Del Jabali is also an excellent day excursion where the kids can see the massive cave, the hanging (and flying…) bats and incredible rock formations underground.